May is New Zealand music month. 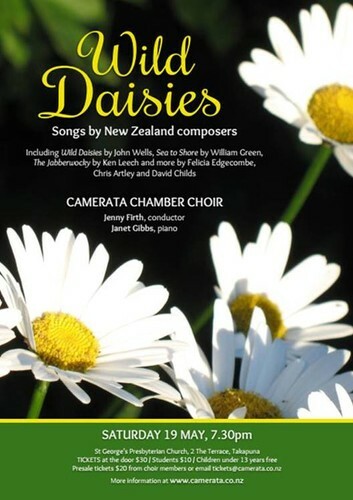 What better time to go wild and attend Camerata’s concert, ‘Wild Daisies’? We begin with a Maori chant of welcome composed in the early 20th Century, after which all our music is by very much alive New Zealand composers, from the long-established and esteemed John Wells to internationally acclaimed David Childs, Felicia Edgecombe from Wellington, and Aucklanders Chris Artley , Cecily Sheehy, Ken Leech and William Green. Our home being the city of sails, we sing a Maori canoe paddling song set by Cecily Sheehy, then go to sea with John Wells’ Call of the Running Tide, and again with William Green’s delightful Sea to Shore –where Devonport takes a starring role. We touch on Solitude with Chris Artley, become lyrical with Wells’ setting of poetry by New Zealanders in Wild Daisies, get quirky while checking out camping with Felicia Edgecombe and sing a lot of nonsense with Lewis Carroll’s Jabberwocky set for choir by Ken Leech.